Martina Götz has practised yoga for 25 years and has been teaching for 20 years, predominantly in the Ashtanga tradition as taught by Sri K. Pattabhi Jois of Mysore, India. She has travelled several times to India to study with the Jois family in Mysore. Before Pattabhi Jois’s passing in 2009 she received authorisation and blessing to teach through his institute (KPJAYI), and attended a teaching training with Sharath in 2010. She has also practiced extensively with Peter Sanson, Dena Kingsberg & Matthew Sweeney, and is certified to teach Matthew Sweeney’s Chandra & Simha Vinyasa Krama sequences. In 2005 Martina was registered as an E-RYT 500 (Experienced -Registered Yoga Teacher 500 hours) through Yoga Alliance. Her teaching is steeped in tradition yet accommodating to each individual students needs. 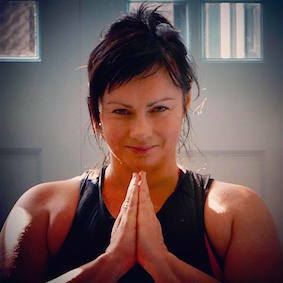 In Auckland she teaches regular weekly yoga classes & leads special monthly classes. She also conducts yoga workshops, retreats & has guest teaching posts, in New Zealand and Australia , either solo or in collaboration with others in particular the Trinity Yoga Collaboration and Vinyasa Krama NZ. She has assisted on various Yoga Alliance teacher training courses in New Zealand and mentored yoga teachers to further develop their skills.